Sufjan Stevens is busy working on a very special gift right now, for a very special person. 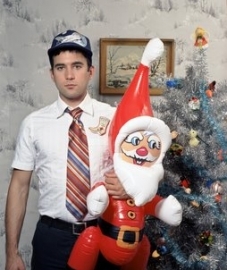 And in the spirit of Christmas, that person will give Sufjan a similarly special gift. Here’s how it works: write an original Christmas song, record it, and email the song to us. Asthmatic Kitty will pick a winner, and that person will trade rights to their song for rights to Sufjan’s song. Just like a gift exchange, Sufjan’s song becomes your song. You can hoard it for yourself, sell it to a major soft drink corporation, use it in your daughter’s first Christmas video, or share it for free on your website. No one except Sufjan and you will hear his song, unless you decide otherwise. You get the song and all legal rights to it. We get the same rights to your song. By submitting your song, you also give us permission to stream it online. Sounds like a fairly decent trade. Interested parties should click here.